Did you know that Dell charges U.K. customers a £16.25 fee (which converts to 27.17 USD as of this writing) to pre-install Firefox on new computers? Mozilla didn’t, but they do now and they’re pretty upset about it. Charging customers for the free browser is forbidden by the software’s terms of service so, as you might expect, the Dell’s fee has Mozilla up in arms. 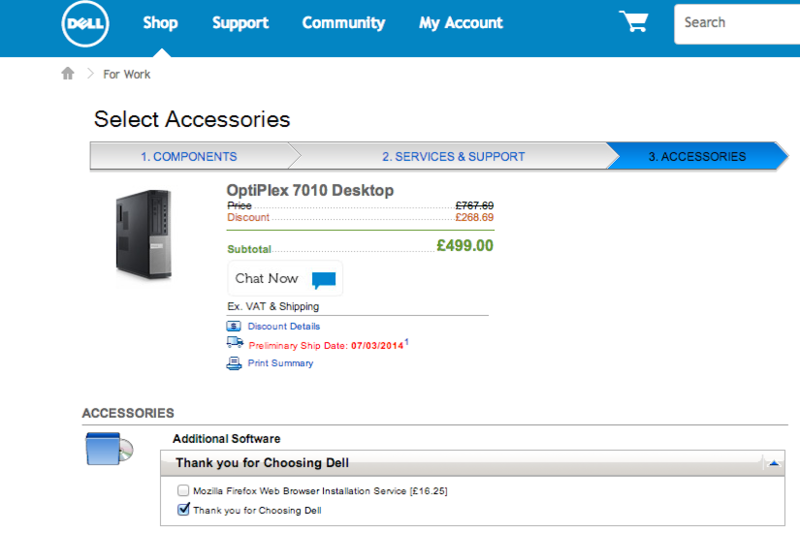 Interestingly enough, Dell only offers this paid pre-installation service for a single model of the OptiPlex 7010 desktop and only on the company’s UK website. A thread on Mozilla’s official forums, however, suggests they may have been charging a similar $15 fee here in the U.S. as recently as September. Technically they’re right. Charging for Firefox-related labor isn’t the same as charging for Firefox. Still, 15-22 dollars seems a little pricey for such a simple service.